Awaken each morning to the sounds and scents of nature. Here, time stands still and serenity reigns. 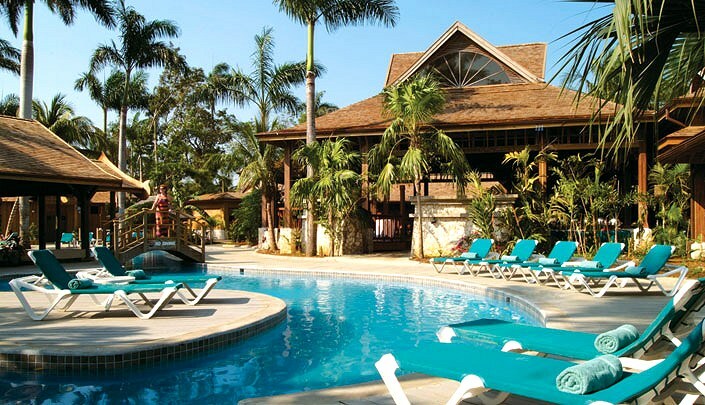 Set amidst gardens of trees and flowering plants at the edge of Negril, Jamaica's laid-back resort area—the intimate, all inclusive. Sunset at the Palms offers chic and serene accommodations—an environment so tranquil and calm, it will leave you breathless. Sunset at the Palms features a trendy, new design, sumptuously appointed guestrooms, new amenities and lush landscaping. Just 85 "treehouse-style" guestrooms stand in a ten-acre tropical garden, a design praised by Architectural Digest. And it's all just steps from the resort's five beachfront acres – two miles of white, sandy beach – hailed as the most blissful beach in Jamaica. From the martini bar to the beach bar, Sunset at the Palms delivers the best of Jamaica's beauty and endless charm. See for yourself why TripAdvisor.com has named Sunset at the Palms one of the top ten most romantic resorts in the Caribbean! Your all-inclusive vacation begins when you step into your "tree-house" style accommodations and wander from the air-conditioned interior onto your private balcony. Walk to the two-mile long, white sand beach and enjoy kayaking, snorkeling, sailing on a Sunfish, a pedal boat or windsurfing. Relax on your chaise by the pool, the spa tub or on the sand. Walk the garden with "Shorty," our resident expert. Treat yourself to meals prepared with fresh ingredients from our ten-acre tropical garden, or take a cooking class to learn how it's done. Casual is on the menu at Negril-and so is great tasting fare, both International and authentically Jamaican. Join us at the Palm Grove restaurant for open-air dining and buffet-style breakfast, lunch and dinner. Dress in your elegant resort-wear best and sample a-la-carte specialties from the eclectic Asian-fusion menu at the Lotus Leaf. Getting hungry at the beach? The Palm Breeze Beach Bar & Grill has sandwiches and Jamaican "jerk" favorites, with our famous Red Stripe beer or other cool libations to wash them down. At the pool? Swim up to the Bamboo Bar to refresh your spirits or pull up a stool after dark for a tropical drink before the night begins. Or, enjoy an afternoon of live music at the Martini Lobby Bar, or join friends to sip a signature martini before dinner. Quench your thirst with your choice of beverages and cocktails. Stay in shape in our new, air-conditioned gym filled with Cybex equipment or play tennis on our hard-surface court. Connect with our free Internet access. Join in our menu of daytime activities and nighttime fun and our weekly cocktail party to mingle with resort managers and staff. And remember: wander without your wallet, because all taxes and tips are included! Complete well being spa packages at the Sunset at the Palms Spa incorporating local salts, oils, fruits and fragrances.